Your going to think one of three things of me, one, I’m really weird, two, pretty creative, three, that girl needs some serious help. I probably need the serious help! Now I know I was going to post a recipe that I made over the weekend that I loved, but I made this for dinner last night and I just had to share right away! I really have no patience! I know your probably thinking, what the heck is that? What did she make now? It’s kind of funny looking. (giggle, giggle) This is my Friends is a Cherry Hamburger! 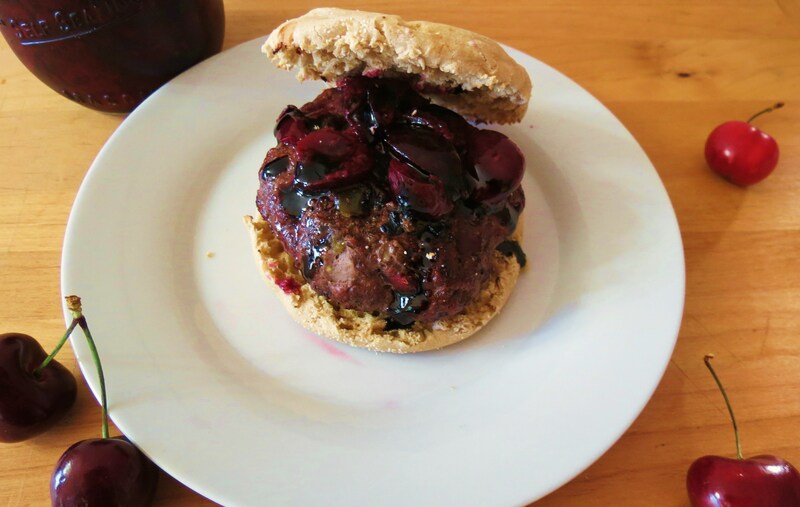 Yes I made Cherry Hamburgers and I”m pretty proud of them. I was unsure at first, but I needed to use up some cherries and I, well I don’t need to explain it to you, I love fruit, I love cherries and I can eat them on just about anything! So there! (I’m sticking my tongue out at you). Don’t judge me!!! Your judging me aren’t you? I made these using 96/4 ground beef, seasonings, jalapenos and some freshly chopped cherries. 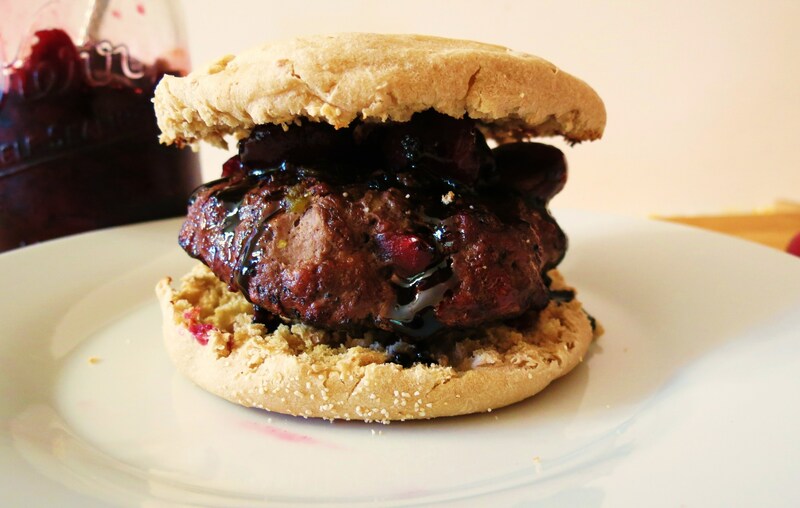 I topped my burger with my Cherry Quick Jam and some of the balsamic glaze from Trader Joe’s. I am so addicted to that glaze! To save on calories I decided to use a 100 calorie Thomas English Muffin for my bun. It worked out perfect. Not too much bread and more meat and sauce. Plus it really held together and didn’t fall apart. I toasted my bun on the grill for some added crispness. You ever notice when you make burgers they always shrink, so I decided to go smaller on the bun to fit the burger. Each burger ways about 4.6 oz and has 250 calories including the English Muffin. The flavor was wonderful on these burgers, sweet and savory with a kick of heat. With the jalapenos and cherry mixture it really complimented each other. 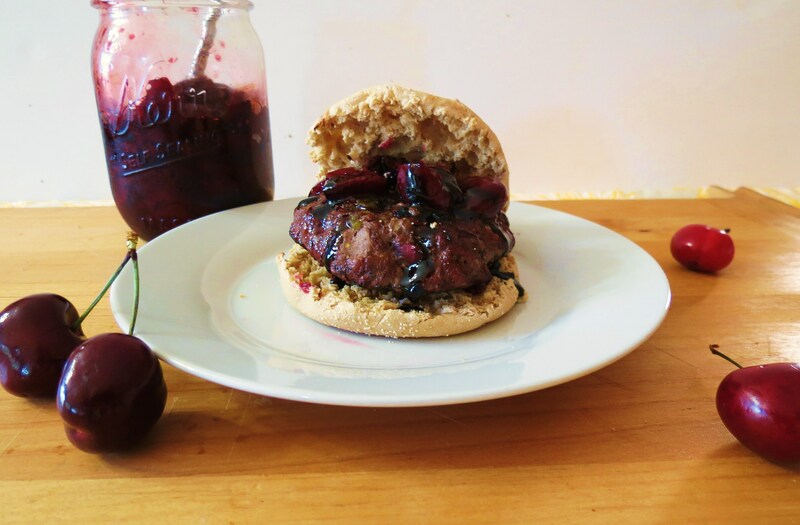 My Cherry Jam isn’t really sweet, so you’re not getting a really sweet burger at all. The balsamic glaze kicked up the flavor a notch. My Husband, who I didn’t tell that there were cherries in the burgers really liked them. He ate two and shhhhhh, don’t tell anyone, but so did I. I loved this burger and I’m kind of sad that there are no left overs. If you’re looking for a different spin on a traditional hamburger than this is a burger for you! You have it all in here, sweet, spicy and savory. I personally think you can’t go wrong with that combination. If your into cheese, you may want to top your burger with some feta or goat cheese. I debated about that, but decided not to at the last-minute. So what do you think? You think I’m weird don’t you? I just can’t believe my Husband ate them!! First time we didn’t have leftover burgers. 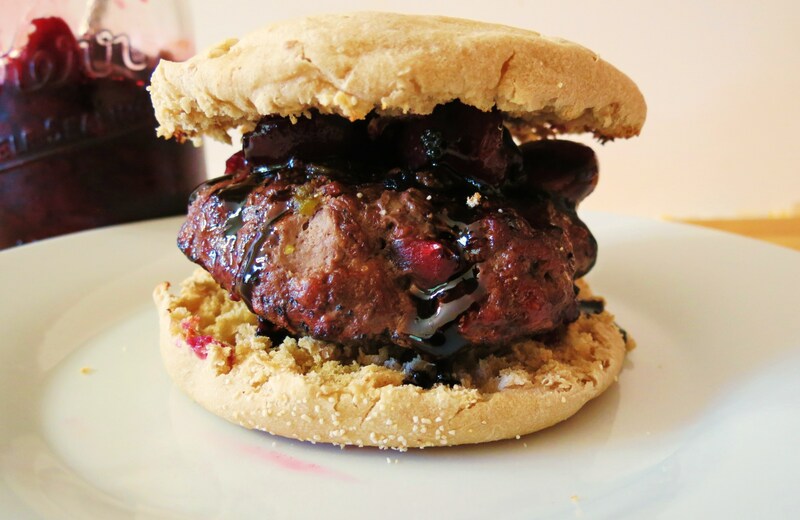 A sweet, savory and spicy burger made with fresh cherries and topped with Cherry Jam and Balsamic Glaze. In a bowl, add ground beef, cherries, jalapenos, dijon mustard, Worcestershire sauce and seasonings. Mix until combined. Divide into 4 equal portions and flatten out to a hamburger shape. Place burgers on grill. Cook for about 7 - 8 minutes on the first side, flip and cook for an additional 3 - 5 minutes. 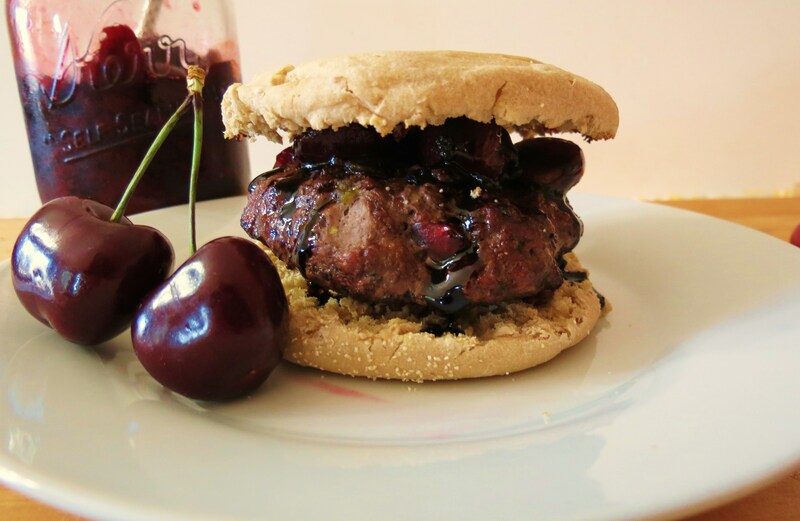 Serve Hamburger on a English Muffin and top with cherry quick jam and balsamic glaze. I hope you like my odd dinner and I hope it doesn’t change your opinion of me, unless it’s in a good way! 😉 I think sometimes you just need to be a little different and experiment with different flavors. You never know what combination your just going to love!! Plus it put a smile on my face, which we all could use on a Wednesday!! I am off to clean my messy Kitchen, and boy is it a mess. No one cleans it but me and sometimes it is too much. Do you have rules in the house, that if you cook dinner than someone else does has to do the dishes? That rule used to apply in my house, but it seems my family got lazy and they don’t care. I swear they would wait for the dishes to hit the ceiling before they touched them. I try to hold off and not do them, but it’s gross letting them sit. Thank you for letting me vent. Off I go to clean! Have a great Thursday!! I’m not judging, I promise! Actually it looks quite creative, unique, and delicious! I love cherries, probably more than just about any other fruit so I’ll come for lunch for sure if you’re serving these! Your welcome anytime. It’s amazing what foods cherries go with!! I fall in the “I think you’re very creative” camp 🙂 “They” totally make a cherry chipotle sauce, so this isn’t out of line at all!! I would add a bit of goat cheese to mine – mmmmm! Thanks Molly!! I was honestly surprised on how well they turned out! Than you should make them!! 🙂 Have a great weekend! Those look delicious! I love homemade burgers with a creative twist! Thank you!! It’s fun to change up your food once in a while! This is quite creative, Jennifer! But, I can see it tasting pretty good. 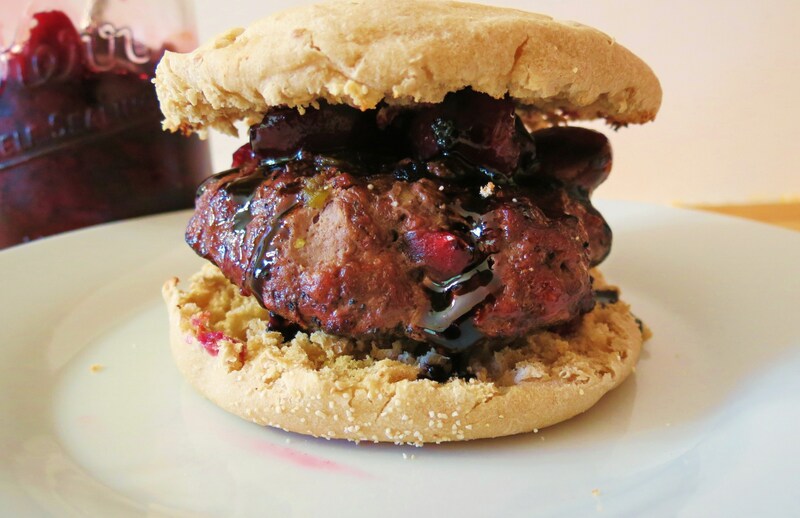 I made red wine burgers recently and the fruity taste was really delicious with the burger so I bet the cherries are also really good! Hmmm, red wine burgers would be good!!! I am going to have to try that!! I love fruit and meat together. This sounds like a great combo! I love this combination! It really surprised me on how well they went together! I figured cherries taste good with pork, why not try it with beef? No. 2 all the way! Very Creative! This actually sounds delicious and I will definitely try it. Thanks so much for stopping by Creative Thursday this week. I couldn’t do these parties without you. Can’t wait to see what you link up next week. Have a wonderful weekend. Ahh Thanks Michelle!! I will be back next week, until than I can’t wait to see what you make throughout the week! and just moments ago when I was assembling the burgers the package of lean ground beef said 240 calories for 4 oz. Is there something I’m missing here?! Wow, my ground beef is 96% lean, I buy it at Trader Joe’s and it is 150 calories for 4oz. The English muffin is 100 calories with high fiber and protein. Hmmm, if you want to save calories, I would just eat the bottom half of the Engligh muffin and eat it opened faced. Just a suggestion. Either way the ground beef is a great for protein and the cherries and onions are just darn good and good for you too. I’m not sure what else to say. 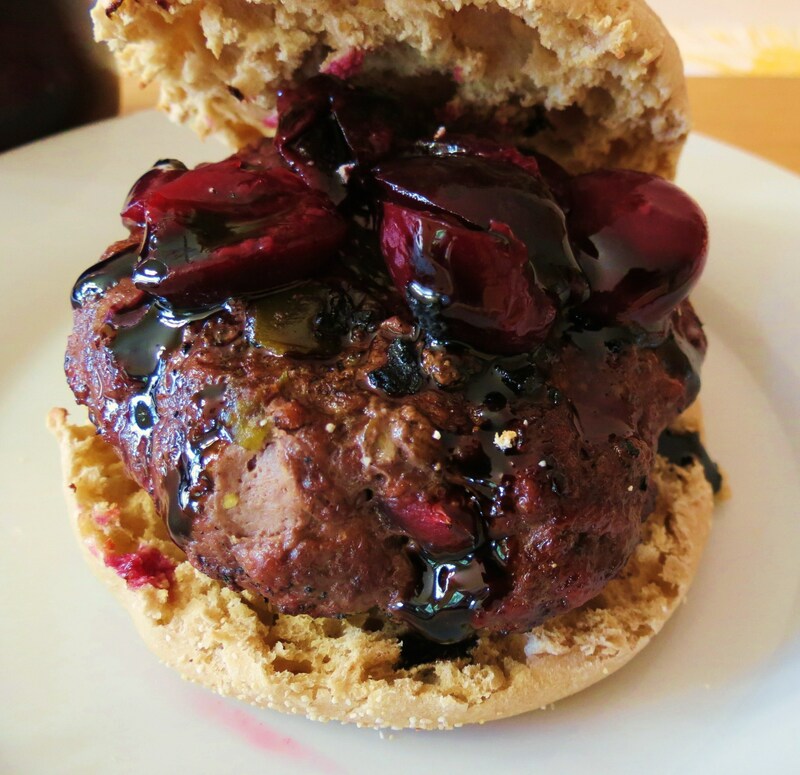 I’ve been using bourbon soaked cherries with hamburger and turkey burger for awhile. It’s a great combination. Going to have to try the glaze and balsamic on my next batch! Ohhh, I bet Bourbon soaked cherries are so good. I need to give that a try. Try the glaze on top, it adds an extra punch of flavor.